It stands in a prominent location on the Promenade as a tribute to the town’s most famous son. It was unveiled by the Queen in 1999. The bronze sculpture features the comedy legend in his classic Bring Me Sunshine pose; one hand raised and a leg cocked. The statue is 6 feet 6 inches high, much taller than his real life height of 5 feet 10 inches. Eric was a keen birdwatcher and there is a pair of binoculars around the statue’s neck. The area around the statue, the Eric Morecambe Stage, contains numerous catchphrases plus the names of every guest that appeared on the Morecambe and Wise Show. It was designed by Graham Young. Bronze seagulls, by Shona Kinloch, are perched on the surrounding rocks. The statue and associated works form part of The Tern Project. In October 2014 the statue was damaged when a man sawed through the right leg during a botched attempt to steal it. The 32-year old thief was arrested and sectioned under the Mental Health Act. Ibbeson restored the statue and it was reinstalled in December 2014. 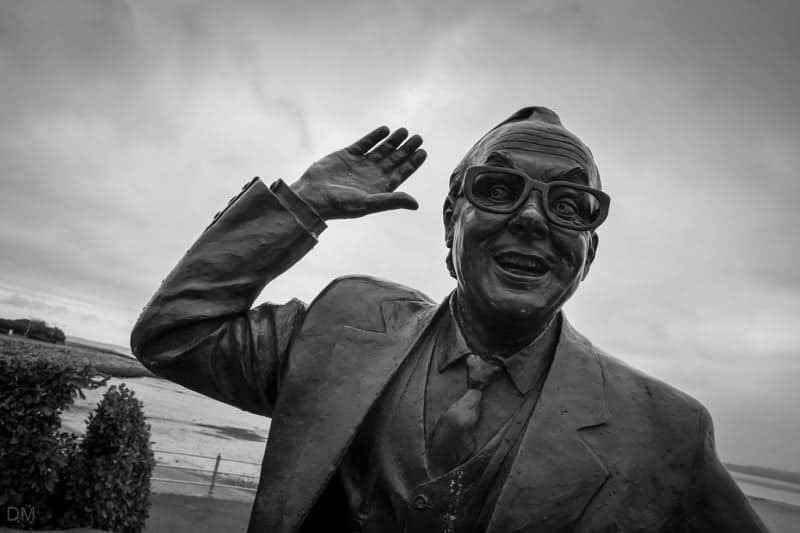 The Eric Morecambe Statue is located on the Promenade (Marine Road Central) in Morecambe, opposite the King’s Arms (postcode LA4 4BJ). Lancaster City Council’s Marine Road Car Park is right next to the statue (parking fees apply). 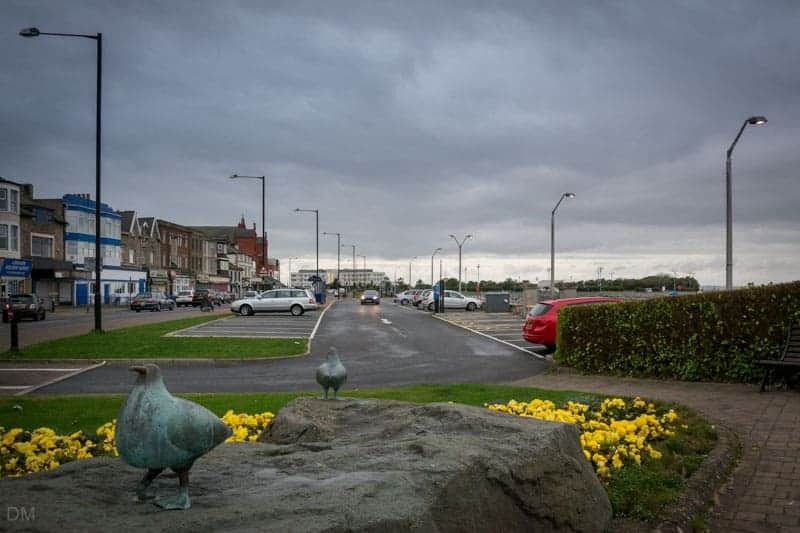 Other works by Graham Ibbeson in North West England include a statue of Laurel and Hardy in Ulverston and one of Les Dawson in Lytham St Annes. Graham Young also has many works in the region, typically incorporating typographic elements. 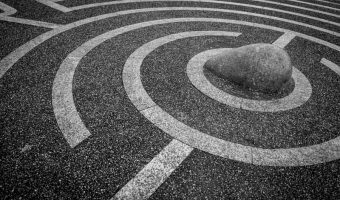 They include the Comedy Carpet in Blackpool and the Cursing Stone and Reiver Pavement in Carlisle. Map showing location of Eric Morecambe Statue. 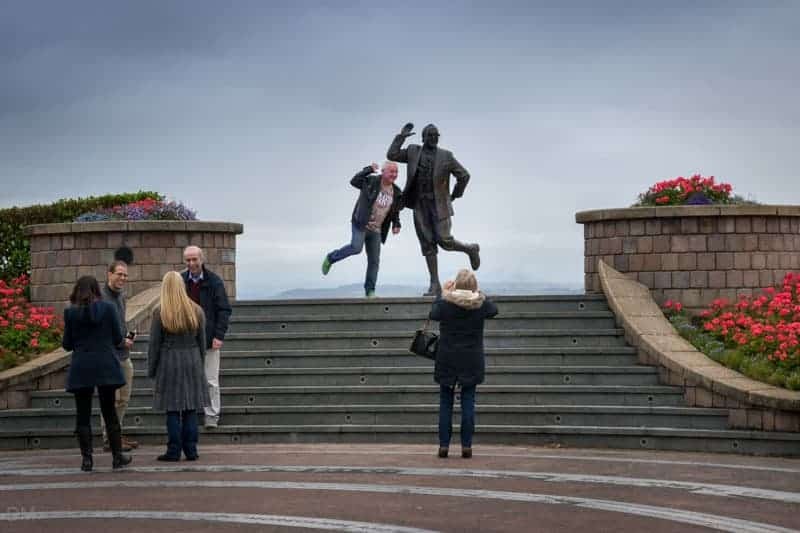 The statue of Eric Morecambe will return on December 11. In October the statue was damaged after a man attempted to steal it by sawing it off at the leg. Lancaster City Council has been working with sculptor Graham Ibbeson to make the necessary repairs. As Eric and Ernie were a double act, it seems wrong to just have a statue of Eric by himself. He looks very lonely. The first time I saw Eric’s statue, I thought it was amazing and a fitting tribute but why oh why did they make SUCH an error with the words of their most famous song, Bring Me Sunshine? The end is Bring me fun, bring me sunshine, bring me love … not what they’ve put there. Did they run out of room to put it correctly or what? So strange. Thank you for teaching me how to laugh as a child and how to make others laugh as an adult. Eric and Ernie will live forever. Thank you for being born. Love the statue and location. On a grey cold day it’s just the place to go to "bring you sunshine". I was devastated on a recent visit to Morecambe to find that some vandals had spray painted Eric’s face green! Have they no respect? I only hope the town council sort it out very soon. The statue is beautiful. It looks so good. Is it the "sunshine" pose? Surely this is the "funny walk" Eric and Ernie did as they left the stage! I am delighted it is there – but surely something is missing! They were always "Morecambe and Wise" – always together – never apart. It doesn’t matter that Ernie wasn’t from Morecambe – he should still be there next to Eric! I was at my niece’s wedding in Morecambe on Saturday and I thought the Midland Hotel would be the highlight but in fact, it was Eric’s statue. He and little Ernie were the family’s favourite always and I felt very emotional as we ‘stood by his side’ on Sunday. The tribute is fitting as it oozes love from every stone and star. Every word is dripping fun and laughter. Thank you to the good people of Morecambe for their kindness. I loved Eric and I still love watching his videos. It broke my heart when he died. My dad and I used to watch his shows. It was our highlight on a Saturday night. Don’t forget Ernie. They made a great double act. I am going to take a trip to Morecambe sometime this year to see the statue for myself. Took a detour from Scotland to Plymouth to see the statue with my fiancée. The first time we met we came out of a pub singing "Bring me sunshine". The song is going to be her walk down music at our wedding in October. Another connection was that my Uncle dealt with Eric’s travel needs when he lived in Harpenden.He was our favourite comedian and still is. Thanks Eric. Eric Morecambe was my dad’s favourite comedian. It made his day when he got a photo taken next to this statue. 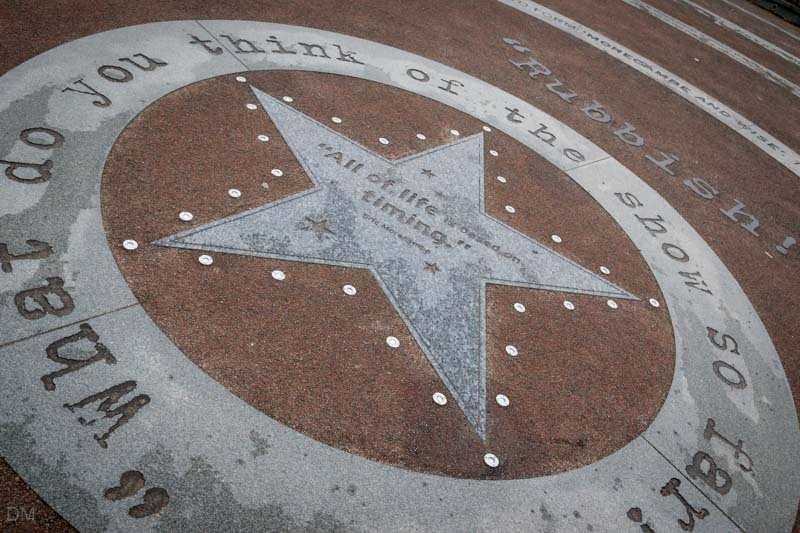 Lyrics from Eric Morecambe’s best known song, ‘Bring Me Sunshine’ are carved into the steps that lead up to the statue.